M. Gonzalez Frances, 15, 14003 Cordova, Spain. 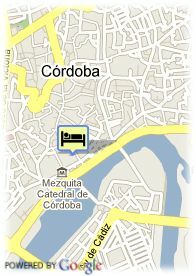 Hotel Conquistador is settled in heart of the historic Cordoba, fully in the Jewish quarter, Conquistador Hotel in placed on same street as Eastern front of Mosque. 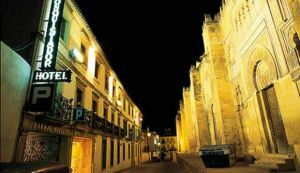 The Lounge Almanzor of Hotel rises overbase which originally was one of the three pavilions of ablutions of famous cathedral of Cordoba, declared UNESCO's Heritage Site. Paid covered parking at the hotel (11.72 €). For older children and adults 20.70 € for each additional bed is charged.